In studying thousands of our user’s sites over the years, we have noticed common mistakes that are made by many of our small business website owners. Most of these mistakes might seem minor but often lead to a significant loss of leads and sales for their owners. Often times, the website owners are not even aware of the mistakes and wonder why their websites are not driving enough revenues to their business. Here are the 5 most common mistakes that small business website owners make. In today’s increasingly mobile world, not having a mobile optimized site is one of the most costly website mistakes you can make. According to eMarketer, people spent $25 billion on purchases made from phones and tablets in 2012 alone, an increase of 81 percent from the year before. Customers are constantly searching for products and local businesses online via their mobile phones, and you want to make sure that your website offers the best experience possible when they visit. 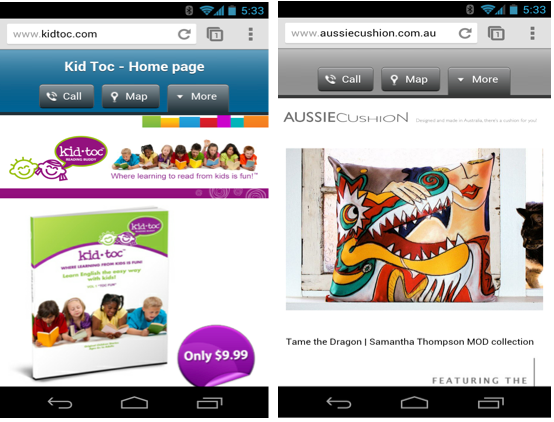 Here are a few examples of mobile websites. Notice the layout and how easy it is to navigate to the key pages. Click-to-call and Maps views are critical to users browsing on their smartphones. 2. Not including a business address and phone number on their contact page. Many small businesses make the mistake of not including their business address and phone number on their contact page. This simple, but common, mistake leads to loss of revenue through lost leads and website conversions from site visitors. As a small business owner, you should do your best to make it as easy as possible for your customer to reach you by email, phone and through your physical address. It is very important to include all available ways through which your customers can reach you so that they can easily select which method is most convenient for them. Optimize your contact page for your visitors by including your business’ contact information. 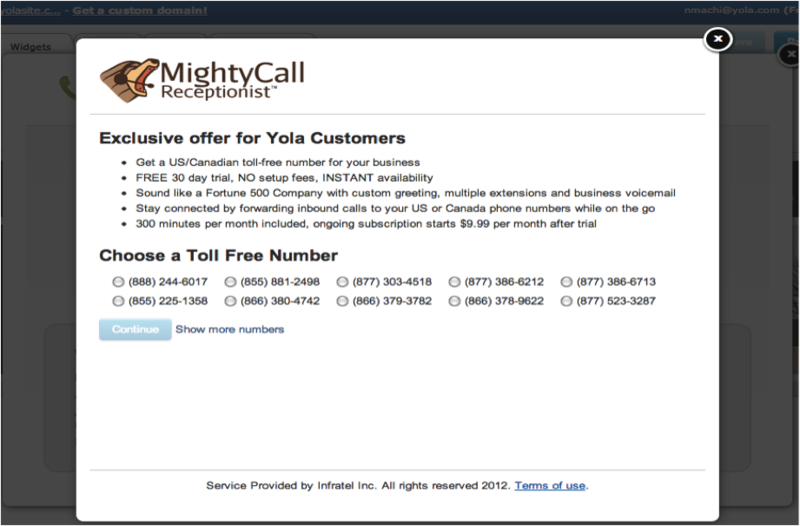 You can take things a step further by getting a toll free number for your business through a third-party company like MightyCall or Grasshopper. This would help your business sound professional and polished with custom greeting, multiple extensions and business voicemail when customers call. The right keywords are really important for getting your business found on search engines. Often, many small business owners wonder why they get little or no traffic to their websites. However, a lot of them have done little to include targeted keywords about their business on their website. Keywords help search engines to index your website based on your content. This will help your customers who use the same keywords find you online when they are looking for a business, product or service. There are plenty of tools to help you determine which keywords you use frequently and which ones are missing from your website. Another common mistake many small businesses make is not investing in social media. In the past decade, social media usage in the world has exploded and many small businesses around the world have been able to grow their business online and engage with many more customers using social media. It is an easy way for small businesses with a small marketing budget to gain fans and start talking to customers about their business. We see a lot of small businesses make this mistake and what a costly one it is! According to Forrester Research Group, video is 53 times more likely to appear on the first page of a search engine. Your online marketing efforts are not complete without video. It is the single fastest growing segment of the Internet and is a great way to add personality to your brand. You can use a promotional video to promote a specific product or service or even an animated video to describe what your business is all about. You can check out our promotional video for the Yola Online Store for an example. We would like to see your business grow in leaps and bounds. Feel free to post in the comments any mistakes or solutions you’ve seen. Small business is now in its second web-influenced decade, and the landscape is changing. Customers have become vastly moreinternet savvy than they were just a few years ago, and businesses thatdon’t keep up with higher levels of web sophistication risk being left behind. Definitely true. I see a lot of more basic mistakes like not doing basic on page SEO optimization, not including relevant images, broken links, or even just having an overall ugly site that is difficult to navigate. Once you get beyond those things, then the list above will come in handy.